Say hello to the Momma Bear of storage units, the 25 cubby storage unit. One of the realities of family life is the gradual accumulation of necessary things, and the need for a place to keep them organized and put away. To help with this, Sprout has designed a storage bookcase that is functional and offers a large amount of storage space, while preserving your style and the modern atmosphere of your home. Like our other storage furniture options, the 25 cubby storage unit is meant to be used with our patterned cardboard storage bins. Together, the bookcase and bins create a modern, simplistic, classy way to keep your life in order. By using patented sprout tension lock tool-less technology, we were able to do away with all tools and hardware that you may usually expect to use when assembling a bookcase of this size. With Sprout, you don't have to worry about tools at all, all you need is a tiny bit of muscle, and the pieces snaps together in a flash. The joints are sturdy enough to hold a great deal of weight but they also come apart with only a little bit of effort. 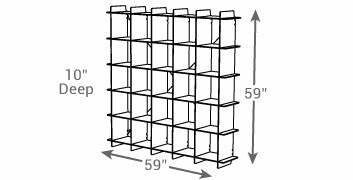 Moving just became easier with the 25 cubby modern shelving unit! Set includes: (1) Mid Century Bookcase, (1) Wall Anchoring Kit & (2) Tensioning Cords.